Azabu is a large area of Minato special ward. It is one of the most international areas in Tokyo, in fact it is home to many embassies and international schools. A large part of Azabu is a high-class residential area, many artists and famous people live there, for example Ayumi Hamasaki or Naoko Takeuchi. I discovered this area just because Naoko Takeuchi, Sailor Moon's creator, lives there, and the manga/anime is set in Azabu-juban. It is a very nice and little shopping district, not far from the busy neighborhood of Roppongi, walking around its narrow streets is very pleasant. Around here there is also one of the oldest temples in Tokyo, the Zenpuku-ji Buddhist temple. Not far from Azabujuban station and very close to Hiroo station you can find this beautiful park, that would be much more famous if it wasn't located in Tokyo. Among the masses of beautiful parks and gardens of Tokyo, it can easily be ignored. Within the park there is a very quiet atmosphere with a beautiful pond where sometimes you can see some "fishermen" trying to fish something. At certain times of the morning the park is filled with many children from the neighboring schools. Moreover, in this park take place a few episodes of the anime and manga of Sailor Moon. 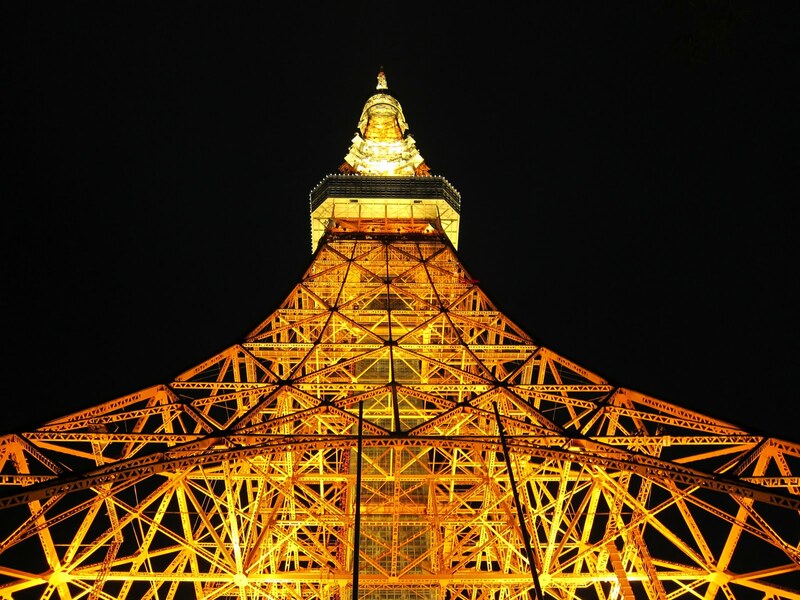 The famous Tokyo Tower is located just south of the area of Azabujuban, facing a park known as Shiba-koen. It was completed in 1958 as a telecommunications tower by the architect Tachū Naitō, who had already projected similar structures in other cities of Japan. You can go up to the top of the tower for a panoramic view, the ticket costs 900 yen for the main observatory (150 meters high), where you can also find a gift shop and a cafe. If you want to reach the highest observation deck (250 meters high) you have to pay additional 700 yen. At the base of the tower is a five-story building with some strange attractions, including the Tokyo One Piece Tower, shops and restaurants. It is a landmark of Tokyo, one of the most famous ones, and in the past it wasn't so uncommon to stand in a queue for a long time to go up to the observatory. Now that the new Tokyo Sky Tree has been opened, the Tokyo Tower has become less popular, especially among the Japanese. A new attraction inaugurated on March 13, 2015 dedicated to the famous anime and manga of One Piece. You can buy the ticket also online, with a small discount (3,000 yen), on this website. Close to the Tokyo Tower there is a famous buddhist temple, the Zojoji temple, which can be visited for free. It might be fascinating for someone to stay in a hotel where you can see the Tokyo Tower from your room. There are some hotels in the area, belonging to a high price range, in particular the Shiba Park hotel and the Park Tower Tokyo Prince hotel. If you are looking for something cheaper, the cheapest hotel of all where you can fall asleep while looking at the Tokyo Tower is located in the nearby area of Hamamatsucho, and is called MyStays Hamamatsucho, with tower-view double rooms from 10,000 yen per night. Azabujuban is famous for its characteristic soba restaurants. A big supermarket with a lot of international imported food, located near Hiroo station. A very popular restaurant specializing in curries, located on the second floor of the building at the base of Tokyo Tower. Curry rice from 1000 yen. Get off at Azabu-juban station for the district of Azabujuban, served by the Toei Oedo line and Tokyo Metro Namboku line. The Tokyo Tower is about 1 km far on foot from there, but the nearest station is Akabanebashi station, the next stop after Azabu-juban station along the Oedo line.